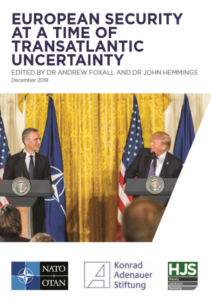 The UK’s leaving of the European Union and Donald Trump’s election as US President have produced suﬃcient uncertainty in the Transatlantic Alliance to suggest that a process of reassessment and reassurance of European security is required. Brexit threatens to result in weaker ties between the UK and continental Europe, and President Trump has taken his “America First” language from the campaign trail into the White House. Together with the spectre of a revisionist Russia to Europe’s east and geopolitical instability to Europe’s south, it is now necessary not only to recognise the importance of NATO to European security but also to grapple with intra-alliance disagreements. In doing so, the question of what role the UK will play in guaranteeing European security post Brexit will be paramount. It is in this context that the Henry Jackson Society, in collaboration with NATO’s Public Diplomacy Division and Konrad-Adenauer-Stiftung, hosted a one-day programme of activities devoted to discussing these issues. The programme included three closed-door round-table discussions and one public panel discussion. The ﬁrst round table focused on “European Security Challenges” and attempted to take stock of non-traditional challenges facing Europe’s security on its southern ﬂank, in Africa and further to the east. The second round table explored “Internal Challenges to the Alliance” and attempted to understand the impact of burden-sharing and of populism, and the impact of Brexit on the Alliance. The third round table, “Deﬁning, Delineating and Defending ‘the West’”, built on the previous round tables by exploring ways in which “the West” is evolving and whether its self-image as a security community alliance still resonates among its leaders and populations. The public panel discussion stood separate from the three round tables and provided an opportunity to publicly address the topic of “European Security at a Time of Transatlantic Uncertainty”. The programme took place on 12 June 2018 in Westminster, London, at the Henry Jackson Society at Millbank Tower and in the UK Parliament. The expert panels featured academics, think tankers, policy experts, and oﬃcials from a range of European think tanks and institutions. The audience, meanwhile, consisted of defence attachés and defence oﬃcials from the various embassies of NATO member states as well as representatives of the UK civil service, including the Cabinet Oﬃce and Ministry of Defence. Also present was a small group of “young leaders” – graduate students from British and European universities who represented a range of NATO member states. The public panel discussion in Parliament was addressed by Admiral James G. Foggo III, Commander of Allied Joint Force Command Naples, and Dr Jamie Shea, Deputy Assistant Secretary General for Emerging Security Challenges. It was chaired by Dr Julian Lewis, Chair of the Defence Select Committee. Overall, the participants were positive about the results of the programme, but under few illusions about the state of the Alliance. It remains beset with internal and external challenges. However, it is hoped that the NATO member states will react to the external challenges by aligning ever more closely.